Occasional Scribblings on life & art by DC based photographer Susana Raab. Much of which is not to be taken seriously. Unless it is about my work which is always to be taken seriously. 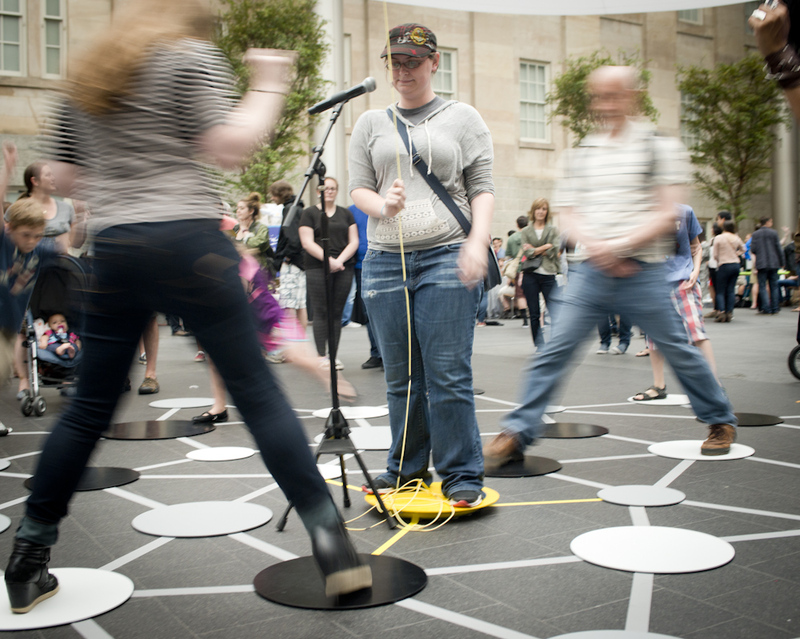 A performance of the kinetic game and art installation, “Starry Heavens” by Eric Zimmerman and Nathalie Pozzi in the Kogod Courtyard of the Smithsonian Museum of American Art. 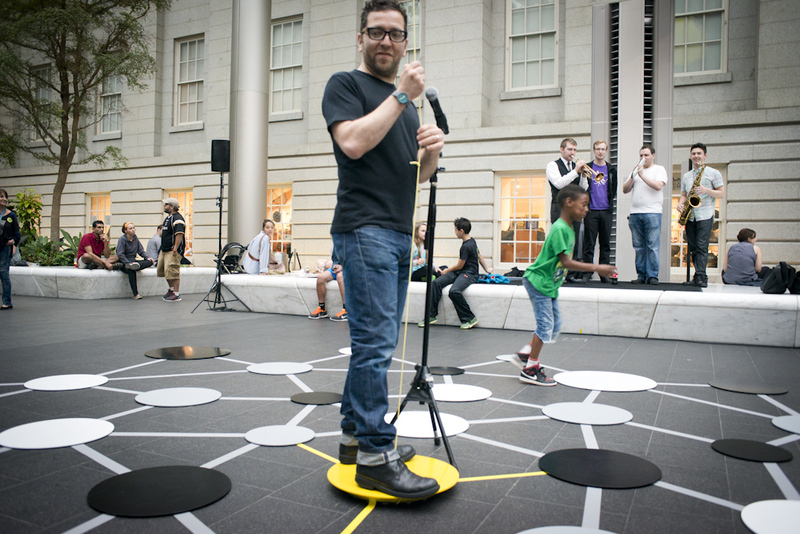 Eric Zimmerman in the Kogod Courtyard of the Smithsonian Museum of American Art. Nathalie Pozzi and Eric Zimmerman have cool jobs. Nathalie is a designer and Italian-licensed architect and Eric is an interactive game designer and professor at NYU. 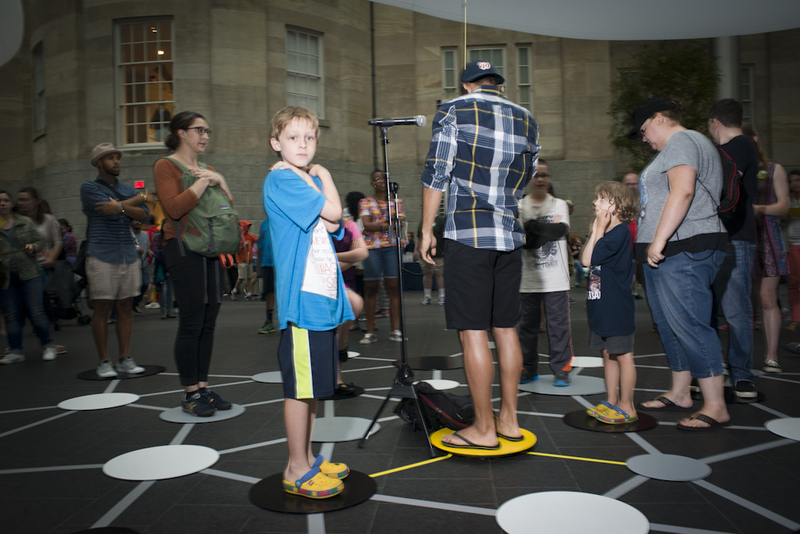 When Eric contacted me to ask if I would shoot their interactive game at the Smithsonian American Art Museum on June 27 my answer was an emphatic yes. Eric did a good job of explaining what they were planning to do, but I still had no idea how this was going to manifest. This is the kind of job I love. After I had the experience of photographing this game installation, I was so impressed by the performance I asked Nathalie and Eric if they would do a Q&A. They kindly said yes, and here it is, along with some photographs from the event. 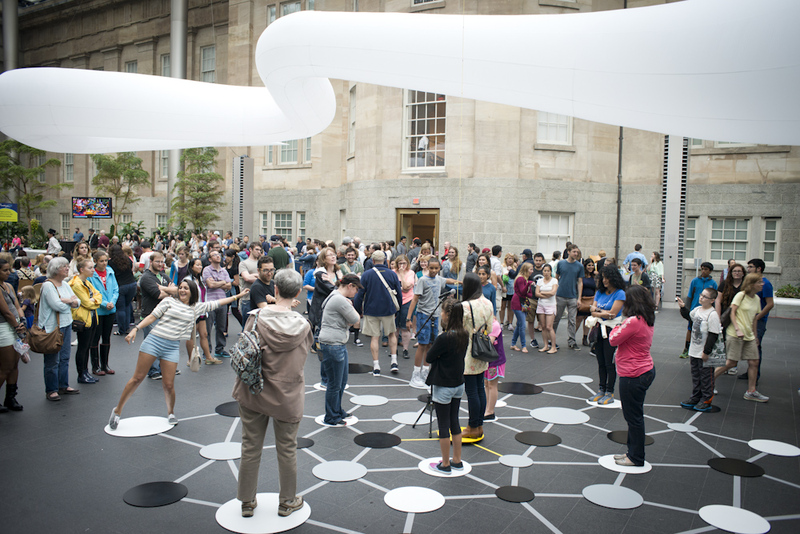 LU: In June Smithsonian American Art Museum hosted your interactive game, Starry Heavens at American Art in the Kogod Courtyard, which is a beautiful skylit air-conditioned venue in the middle of downtown. 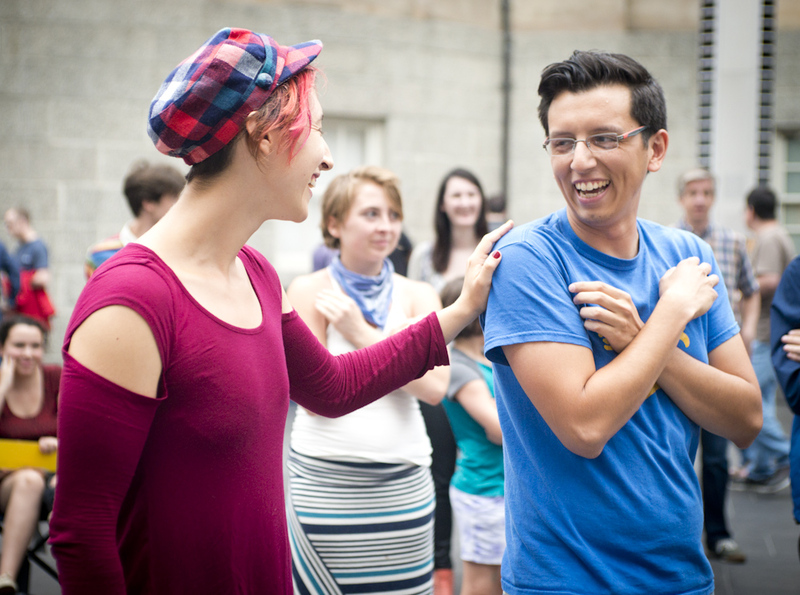 It brought together a lot of strangers into a symbiotic space and created interaction, connection and touch among disparate groups of people. Your day jobs are related but different: architect and professor of game design. How did this collaboration come about and how does it relate to your day jobs? E: Our collaboration came about a bit unintentionally. I had designed a sport for the Come Out & Play Festival of street games and at the last-minute, I asked Nathalie for help with the final installation. 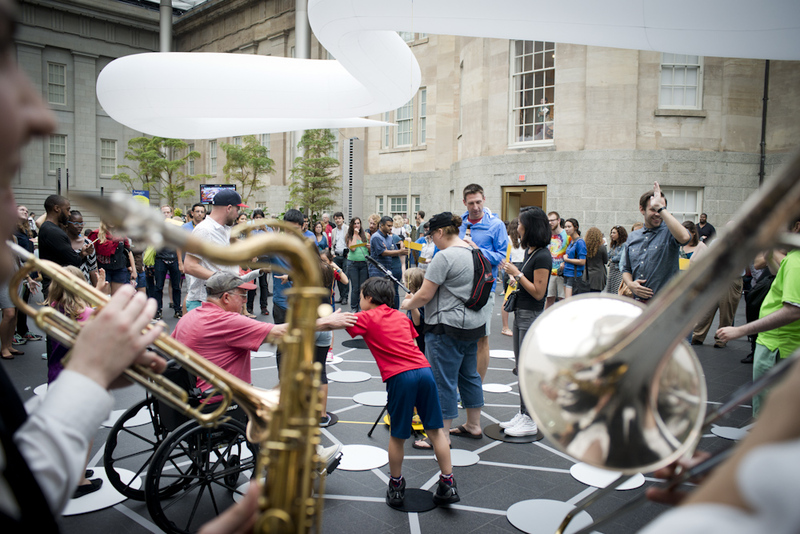 We really enjoyed working together, which led to our first collaborative project: Sixteen Tons, an installation for the Art History of Games Conference in Atlanta. N: I see our work together within a shared context of design. As an architect I always combined more traditional projects (I’m renovating a house on the Alps) with projects that are related to temporary installations or artworks (I often assist artists in the installation of their projects). Eric also makes a wide variety of games – some more traditional, some more experimental. So working on these large-scale game installations is very much integrated into our ongoing design thinking. LU: What was Starry Heavens’ genesis and previous iterations? N: The first version of Starry Heavens was commissioned by Kill Screen for an event at the Museum of Modern Art in New York City in 2011. We installed it in the MoMA sculpture garden, in front of a 2-story glass window facade. That version of the project used ten helium-filled meteorological balloons as the “floating” element. We have also shown the work at the Play Publik festival in Berlin and the Playful Arts festival in Den Bosch, Netherlands. E: From the start, Starry Heavens was intended for a party or social event. The game design reflects this: there is no start or end to the game, so people can enter and leave as they wish. Starry Heavens works with as few as 6 or 7 people, but it really scales well up to 30 or 40 players at once. We also like the way that the game draws a crowd – people learn by watching and then gradually can decide to enter the game and play. LU: And the giant white balloon? how did you come up with that? Did you get any feedback on that? Its too bad it was only up a few days. N: The idea of a “Starry Heavens” that floats above the players is an important part of the space design. In the past, we used large helium-filled weather balloons for this element. 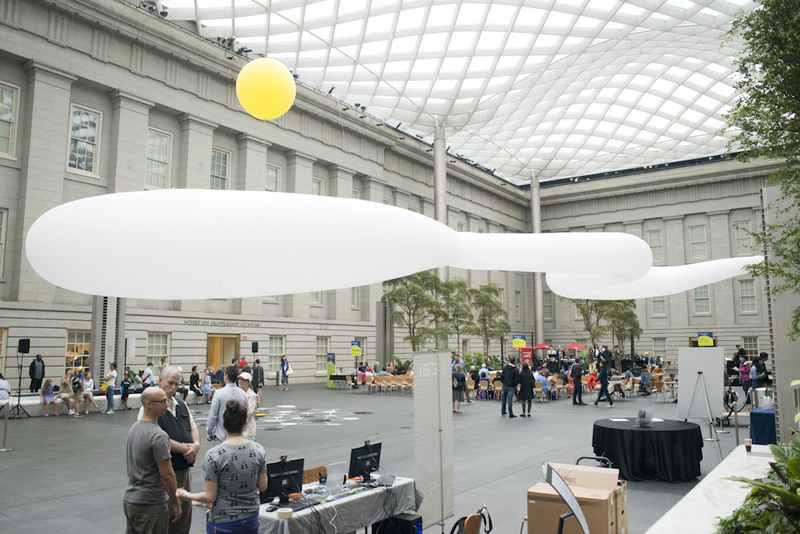 But given that Helium is a non renewable resource, and some of the limitations of using giant helium balloons in the past, we decided on a different approach for the Smithsonian. The white “curve” is a cold air inflated, suspended structure that we designed specifically for the Kogod Courtyard with Erik van Dongen at Air Design and designer Clara Ranenfir. We think it is a good improvement from a technical and space design point of view. LU: What was the idea behind the nomenclature: ruler, banish? the kant quote: the moral law within? E: The title of the project is a reference to Kant’s epitaph: “The starry heavens above, the moral law within.” The game is a kind of moral fable. 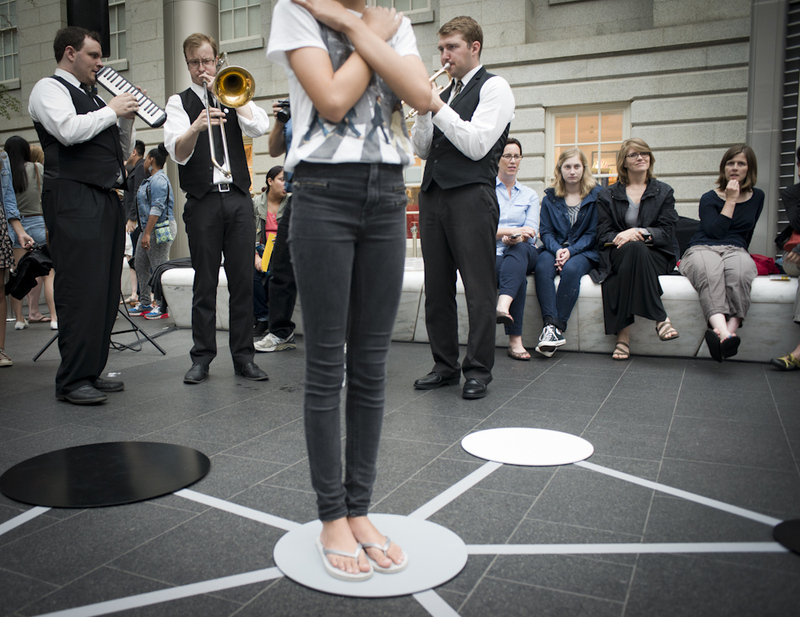 The central player – the Ruler – commands all of the other players, telling them how and where to move. These players must work with and against each other to overthrow the Ruler, who stands at the center pulling down the central balloon. But the Ruler’s desire to reach skyward feels meaningless and absurd, and ultimately distracts from the unruly subjects. Starry Heavens is a kind of abstract political cartoon in the form of a game. 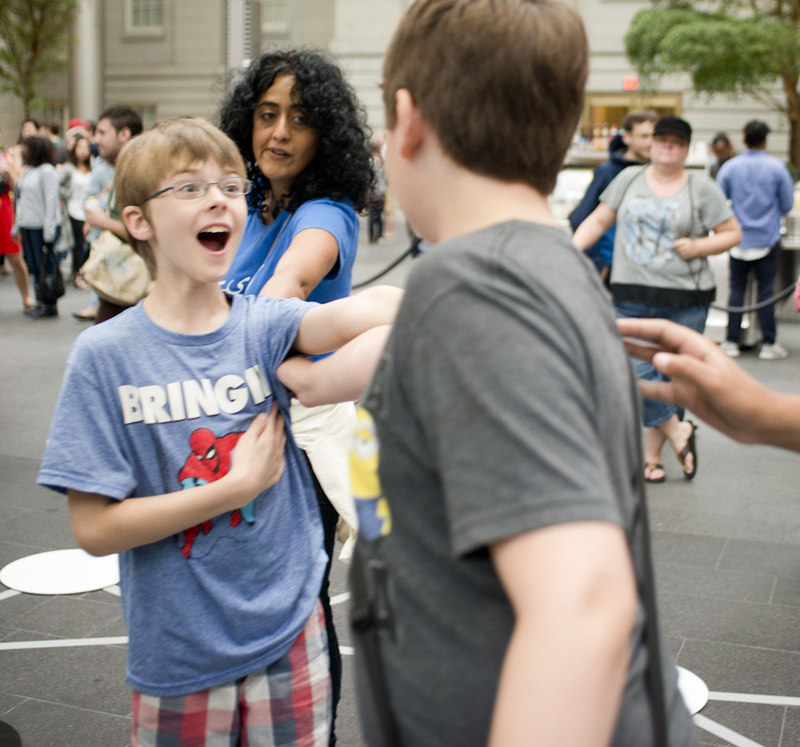 LU: How was your experience exhibiting at American Art compared to other productions of your interactive experiences? audience, etc. N: In the past, Starry Heavens has generally been played outdoors at night. The Kogod Courtyard, although indoors, has many qualities of an outdoor space. It is an incredibly beautiful setting that had a strong influence on defining the new inflatable element. We are very grateful to the American Art Museum for supporting this new version of the work – they pushed us conceptually and technically to evolve the work to a new place. E: The audience was also incredibly diverse! We haven’t had a situation with such a great mix of players – young children, college students, older adults – all playing together. LU: What is your goal in creating this work? N: As designers, we like the idea of responding to a specific space and context. Each time we exhibit Starry Heavens there are new considerations in terms of design, audience, and installation. For me, working with these changing constraints are what keep the project interesting. E: I love inventing new ways for people to play. Working with Nathalie lets me design games for spaces and contexts where people don’t normally encounter games. And hopefully they interact in ways that would never happen otherwise. And how does its practice jive with your day job? E: We both have independent design practices – making videogames and tabletop games (for me) and designing buildings, furniture, and objects (for Nathalie). The work that we do together is a kind of design research – because there are less commercial constraints, we are freed to do stranger and more unusual work. And we continue to learn from each other on each project we make together. LU: What are you two working on next, do you have any upcoming events? E: We are in fact working on a concept for a new project. N: But that’s not very helpful – sorry! We can’t say too much about it since it is in the very early stages, but… we do know it would take over several rooms of a building and the working title is “Waiting Rooms.” Hopefully there will be more to say in the months to come!